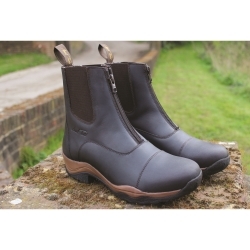 MT Milford Zip Jodhpur BootsBack by popular demand this zip up style boot is a must for the busy and active equestrian lifestyle. The have a Scotchguard treated water repellent outer and also made from strong leather. Featuring a shock absorbing TDR inner sole and Dermo Dry lining.